Our Rhyme Time and Story Hour programs will resume the week of September 9th. Rhyme Time is held every Tuesday at 11:00 am for infants and toddlers. This program involves stories and lots of music & movement! Story Hour is held every Wednesday at 10:00 am for preschoolers. This program includes stories, music & movement, arts & crafts, snacks and more! The schedule for these programs follows the Barnstead Elementary School yearly calendar. Please check our online calendar or call the library if you have any questions about these programs. Come in to the library any time during the week of September 2nd and make your own cards to help celebrate all the wonderful grandparents in your life! Materials will be provided. 1000 Books Before Kindergarten is a program that encourages parents and caregivers to provide positive, nurturing early experiences by reading aloud to their children regularly. Research shows that the most reliable predictor of school success is being read to at home during early childhood. The brain develops more rapidly during the first three years of a child’s life than at any other time during the lifespan. Reading to children from an early age can help close the vocabulary gap and prepare children to enter kindergarten with the skills they need to succeed. Most important, sharing books with children promotes a lifelong love of books and reading. You can sign up at the library or online at oscarfoss.org. Families can pick up a packet with information and materials needed for the program at the library. The Congregational Church of North Barnstead, UCC was established in 1820. The congregation will celebrate 200 years of service to the community with a variety of activities in the year 2020. Affectionately known as CCNB, the church is located at 504 North Barnstead Road in Barnstead. One bicentennial project is to assemble a church history by collecting memorabilia, pictures, documents, written records, diaries or any other items relating to the church from any period during the 200 years. They will be displayed during 2020. People in the area, especially longtime residents, may have collected or inherited materials illustrating some phase of the church’s life or its activities in the community. We invite them to consider contributing the items or copies or pictures or descriptions of them to the church archives. Donated items, large or small, (no donation is too small) may be brought to the church or be picked up by appointment. Call Barbara Moulton at 875-5651. Many of our members are new to the area, so we appreciate everything that will help us to learn how the church has operated over the years. CCNB has grown from a few dozen to almost a 100 in recent years. Active through the 19th century, the congregation voted to operate in the summers only from the time of World War 1 until the year of 2000. The congregation drew from both year round and summer lake shore residents. Now in the 18th year of conducting services full-time, CCNB is again a very active and welcoming church with a number of mission objectives. Children and youth activities are a priority, and the church sponsors children attending the UCC summer camp each year at Horton Center near Gorham NH. Everyone is welcome to attend worship at 10:00 a.m. each Sunday. Anya Nichole Hales of Barnstead, NH, and Andrew John Kelley of Waterville, Maine, were married on Saturday, August 11, 2018 at the Elks Lodge in Epsom, New Hampshire. The bride is the granddaughter of Ms. Susan Crawford of Barnstead. The groom is the son of Jen White of Haines City, Florida and James Kelley of Smithfield, Maine and stepson of Misty Futch and Karen Kelley. The Maid of Honor was the bride’s friend, Franchesca Panniello, of Rochester and the flower girl was Rori Kelley, daughter of the groom. Misty Futch, wife of Jen White, accompanied the bride down the aisle and James Kelley, the groom’s father, served as best man. 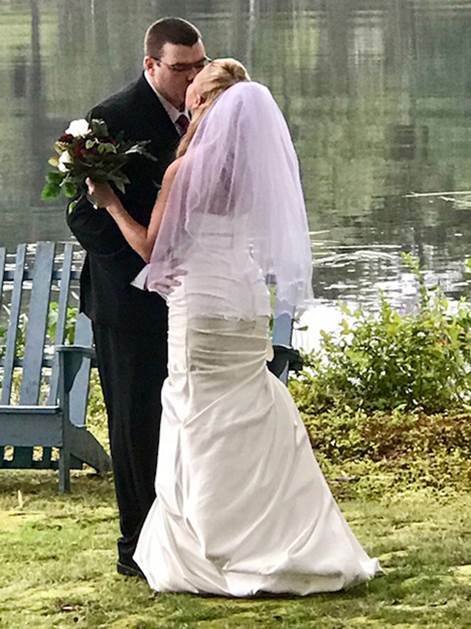 The bride is a Ballet Instructor at Concord Dance Academy as well as an insurance agent at Gregg Jodoin’s Allstate Office in Concord. The groom is employed as a ramp supervisor for United Airlines at Boston/Manchester Regional Airport. Following the ceremony, a dinner and dance reception was held at the Elks Lodge in Epsom. After a honeymoon to Nassau, the Bahamas, the couple will reside in Pittsfield, NH. This fall Central New Hampshire VNA & Hospice will offer monthly “Parent Circles” for those grieving the loss of a child. Groups will be offered in Wolfeboro and Laconia and are free and open to the public. “Parent Circles” are monthly gatherings for parents who have lost children at any age to any circumstance. These gatherings were initiated by local parents who have said how vital and nourishing it is have ongoing connections with parents who have suffered a loss like theirs – to listen, to share, to remember, to give and receive support, and to bear witness to each other. Grief affects all of who we are – our bodies, minds, hearts, relationships, and spirit – and each of us will find different paths to express and cope with our grief. These groups offer an opportunity to share and learn alongside others whose hearts and lives have broken open. Together we discuss common grief experiences and discuss ways of coping with loss and making our way in a changed world. The Wolfeboro “Parent Circle” will be offered on the 4th Tuesday of the month from 6:00 – 7:30pm on August 28, September 25, October 23, and November 27. For more information about the Wolfeboro “Parent Circle”, please call Rev. Gina Finocchiaro at 569-1555 or revginaf@gmail.com. The Laconia “Parent Circle” will be offered on the 2nd Thursday of the month from 6:00-7:30pm on September 13, October 11, and November 15. For more information about the Laconia “Parent Circle”, please call Dan Kusch at 524-8444 or dkusch@centralvna.org. I had the opportunity to travel to Washington D.C. this month at the invitation of the White House Intergovernmental Agency. Elected officials in the State were sent invitations to have an open discussion with several agencies. It was a bipartisan delegation at the meeting that included NH State Representatives, Sheriffs, a City Mayor, and a NH State Senator. The administration is inviting all 50 states to Washington D.C. in hopes of having an open and transparent dialogue with us. New Hampshire was the 25th State invited. We heard from several people representing the following departments: Intergovernmental Affairs, Veterans Affairs (specifically Veterans Benefits), National Drug Policy, Housing and Urban Development, Domestic Policy, Commerce, Transportation, and Education. The last speaker was the Special Assistant to the President and Deputy Director of Intergovernmental Affairs. He spoke of a few things, but most importantly he wanted to let us know that school safety is a top priority for this administration. I also had the privilege of speaking with the Deputy Director of the Office on National Drug Control Policy regarding the addiction crisis in the country. We discussed when the Opioid crisis was first noticed, and why it was not addressed earlier. We discussed what the bureau is doing to prevent the next addiction crisis. They were very knowledgeable, and we agreed that being proactive instead of reactive as we are doing now, is the best course of action. It was great to hear that these agencies are already looking ahead.